The beamline 911-4 at MAX-lab, Lund. Photo credit: Annika Nyberg. Using the new beamline, 911-4, at MAX-lab in Lund, Sweden, researchers can study a wide range of different types of material with a resolution of a few nanometres. This could be useful for both basic research and industry in general. The facility is the result of a DanishSwedish collaboration. Now it is opening for research. 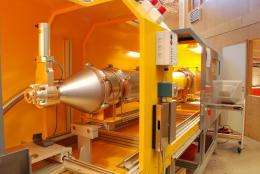 The new facility is a SAXS beamline, which means that it is used to examine the components of materials and their morphology with the help of an X-ray scattering method. This provides a rough picture of the structure of the sample and makes it possible to see the general shape and size of the particles or how close they are to one another. The SAXS method can be used for any kind of sample (solids, liquids or gases). This makes it attractive for various different fields and classes of material  SAXS is successfully used in the study of soft matter, mainly synthetic and natural polymers and biomacromolecules in solution, and is also relevant in the analysis of metals, alloys, glasses and porous materials in general. Basic and applied science fields can benefit from the use of the new facility. SAXS beamlines are present in several synchrotron radiation facilities, and at MAX-lab the method has previously been used with great success on the I711 beamline. After five years of preparation, the new beamline is now open to users. The first experiments were done in February and the first measurements with external users were made in April. One feature which makes MAX-lab's new SAXS beamline special is that it is unusually easy to use. The X-rays are also fivesix times stronger than at the previous facility. The SAXS method is a very flexible technique that has become increasingly popular as new user groups have realised its potential. This was one of the reasons for the decision to build the new beamline. The investment in the SAXS beamline 911-4 at the MAX II ring is a result of ongoing DanishSwedish collaboration. Thanks to funding from sources including DANSCATT and expertise and staff from the University of Copenhagen and MAX-lab, the project has become a reality. Research is conducted at synchrotron radiation facilities all over the world. In Sweden there is one such laboratory: the national laboratory MAX-lab in Lund. SAXS stands for Small-Angle X-ray Scattering. Construction of a new synchrotron radiation facility in Sweden  MAX IV  has begun. There are also plans for a SAXS beamline at MAX IV. Research is conducted at the beamlines' experiment stations. Depending on how the beamline and the experiment station are constructed, different types of experiments can be carried out.